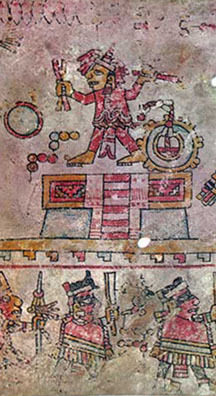 "This is a first-rate publication, in full-color facsimile, of two Mexican history manuscripts from the Mixtec region with a description and commentary by Professor Nowotny. The excellence of the facsimiles can be judged from the fact that one can see the craquelure and even tell whether missing areas of color are abraded or have flaked off the surface. Nowotny points out in his excellent description, for example, intentional destruction of material in Becker I as well as some heightening of line where it had been damaged, both clearly visible in the reproduction... Professor Nowotny and the Akademische Druck-u. Verlagsanstalt are both to be congratulated for making these facsimiles and their commentaries available to the scholarly world." Graz 1961. Vol. 4 of the series CODICES SELECTI. True-color facsimile edition of the hand painted manuscript in possession of the Ethnographical Museum, Vienna (Inv.-Nr. 60306 and 60307). 20 folded pages. Format: 180 x 245 mm and 270 x 285 mm, total length: 4,08 m, folded continuously in PreColumbian screenfold format. German commentary by K. A. Nowotny, 20 pages, 4 text illustrations.